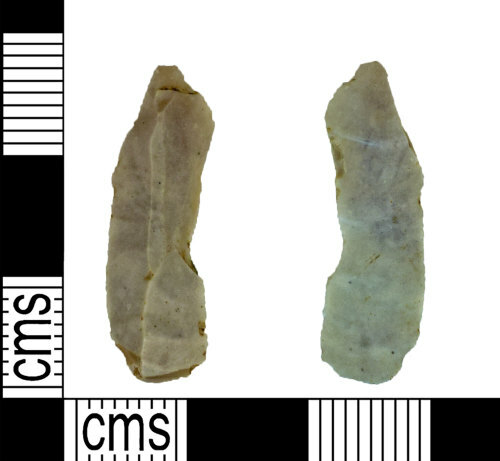 A complete flint scraper of Mesolithic date (9000 - 3450 BC). The lithic is sub-rectangular in plan and plano-convex in section. The dorsal surface contains one predominant negative scar with corresponding arrises. The distal end has been semi-abruptly blunted, the proximal end has been abruptly blunted and all other edges contain semi abrupt retouch. The ventral surface is predominantly flat with evidence of negative scars. The flint is a light grey in colour. Length: 26.26mm, Width: 8.30mm, Thickness: 3.62mm, Weight: 0.8g.